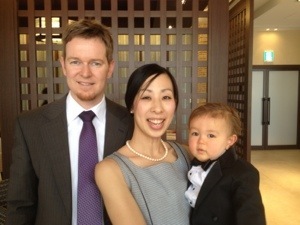 On Sunday I attended my wife’s cousin’s wedding in Kitakyushu. I tell ya Japanese people really do spare no expense when it comes to weddings! My experiences of weddings in New Zealand and Australia is largely a fun party atmosphere day whilst celebrating the union of your friends or family. Many people choose to have a wedding whilst trying to save money wherever possible. My parents are a good example, they got married in our backyard! Japanese weddings are a different kettle of fish. Gourmet food, intricate decorations, elegant outfits, meticulous preparation, Photo and video shows, gifts for all guests to name a few things that are fairly part and parcel at a wedding in Japan. From what I have heard since being in Japan it is not uncommon for a Japanese wedding to cost in the vicinity of ¥3,000,000. (NZ$38,000) Wow that’s a new car or a deposit on a house or a round the world trip! And then of course there is the honeymoon which most Japanese couples will do after the wedding! In saying this, wedding in Japan doesn’t have to be that expensive. It is standard practice for family members to bring a monetary gift of around ¥50,000 and friends to bring a gift of ¥30,000. Also bosses and parents often give more. If you choose to spare some expense at your wedding you can come out even! •Different kettle of fish – 別問題、別の事柄 – totally different meaning/subject. •Part and parcel – 重要な部分、要素、要点 – normal occurrence or thing. •To come out even – プラスマイナスゼロになる、差し引きゼロになる – not lose any money after spending (after spending betting or investment) to receive spent money back. •Gourmet – グルメな食べ物 – high quality delicious food.